No longer in production and limited to stock on hand ... get one while you can ... deal! Prices and selection subject to change at any time. Don't miss out! 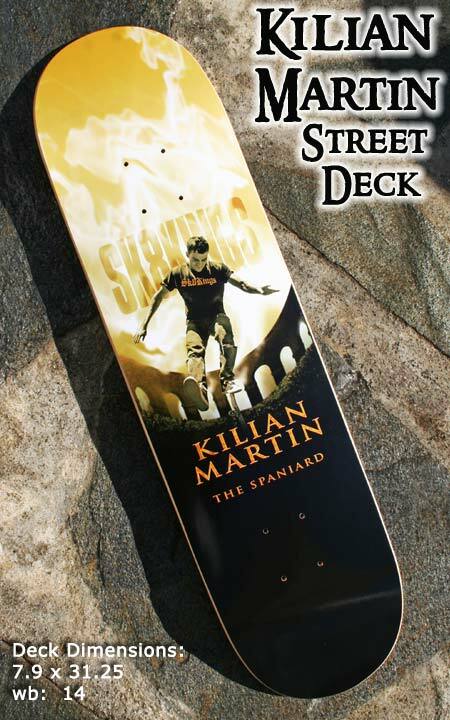 COLLECTOR ITEM -- WHEN THEY'RE GONE THEY ARE GONE -- LAST CHANCE TO OWN ONE OF KILIAN'S FIRST PRO MODEL DECKS! The Kilian Martin street deck featuring modern concave and kicks for excellent performance across the board. Finished off with a slick looking "Gladiator" inspired graphic. Deck sold alone or with optional grip tape and/or skid plates. DECK SPECS: Overall dimensions: 7.9 x 31.25, wb: 14 Crafted from 7-ply hard rock maple in So Cal USA and featuring full board bottom photo graphic. Deck ships with FREE stickers. Optional Upgrades: Skid Plates: Add a set of our King Plate skid plates to protect and add longevity to your deck. Grip Tape: Add a sheet of black grip tape for your deck. Choose upgrades when ordering -- additional charge applies. Note: Skid plates and grip tape come unapplied unless you request otherwise in the notes section. Logo Tee/Hoodie/Hat: Save $5 on a logo T-shirt, Hoodie or Hat when ordered with a deck or complete. Choose the item to add and indicate logo choice and size in the notes section when ordering. 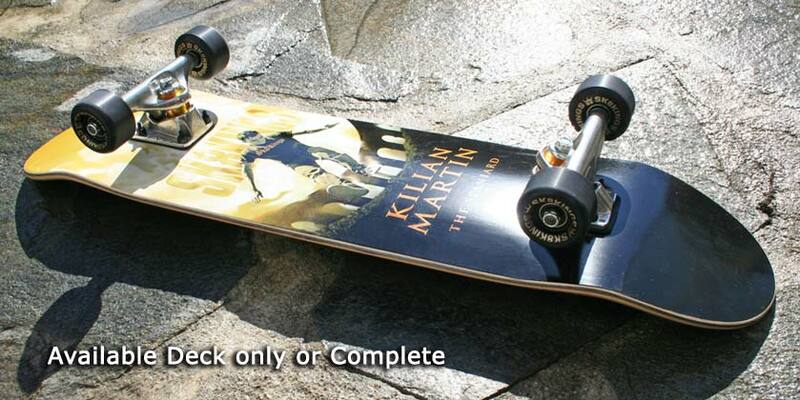 COMPLETES: Order your Kilian Martin setup ready to ride out of the box. See complete option below. Check out Kilian Martin on You Tube -- over 3 million views !